Newcomer Family Obituaries - Lenore A. 'Lee' Shew 1930 - 2019 - Newcomer Cremations, Funerals & Receptions. 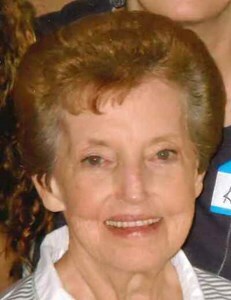 Lenore A. Shew, "Lee", age 88, of Akron, Ohio, went home to be with the Lord on April 11, 2019 at Alter Care of Kent. She was born on September 1, 1930 in Akron, the daughter of the late John C. and Glade (nee Hughes) Davidson, Sr.
Lee was a 1948 graduate of Ellet High School and was a homemaker, who enjoyed flower gardening, traveling-especially the Smokey Mountains, and playing cards with her husband and friends. Lenore's greatest joy was spending time with her family, especially her grandchildren and great-grandchildren. When each of them were born, she had to be one of the first people there to pinch their cheeks and count their fingers and toes. Lenore was a member of Harmony Baptist Church in Tallmadge. Survivors include her husband, Robert O. Shew, whom she married on March 7, 1953; her children, Pastor David O. (Sherry) Shew, Douglas (Kathy) Shew, and Karen (Michael) Hamlin; her 10 grandchildren and 16 great-grandchildren. Her brother, Douglas J. Davidson, also survives. Other than her parents, Lenore was preceded in death by her brother, John Charles Davidson, Jr.
Memorial services will be held on Saturday, April 20, 2019 at Harmony Baptist Church, 1127 Southeast Avenue, Tallmadge, Ohio at 12:30 PM. Family and friends may gather from 11:00 AM until the time of the service. Add your memories to the guest book of Lenore Shew. Remember the first time we met. You thought from behind that I was Owen. You tapped me on the shoulder & the look on your face when I turned around was priceless. Oh my! So many memories of Lee! They tumble around over the years! The one best best memory "Your laughter and sparkling eyes"
Thank you Lee dear for being such a loving sister n law! I love you and the joy of you!